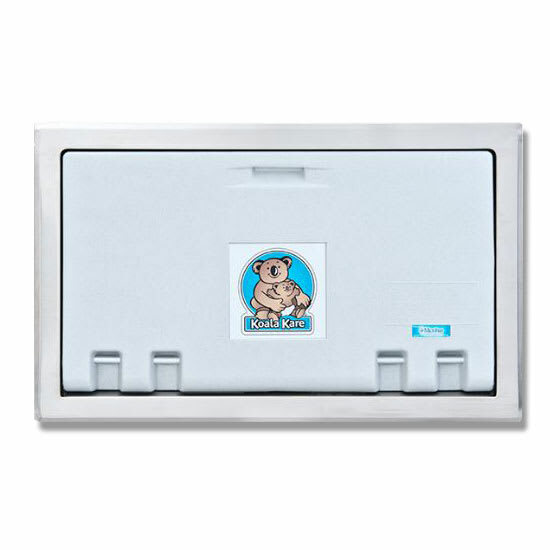 The Koala Kare KB100-05ST horizontal recess-mounted changing station is made of white granite polyethylene that resists odors and stains. It has Microban® antimicrobial protection to prevent the growth of bacteria, and when mounted, it will be recessed into the wall. 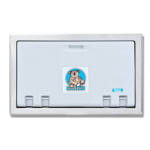 This changing station is equipped with a pneumatic cylinder and a full-length steel-on-steel hinge mechanism to safely close the unit. Adults can store their bags on the bag hooks, while nylon safety straps hold a child in place. For added protection, a built-in liner dispenser is included. The Koala Kare buyers' guide has in-depth information on childcare products.